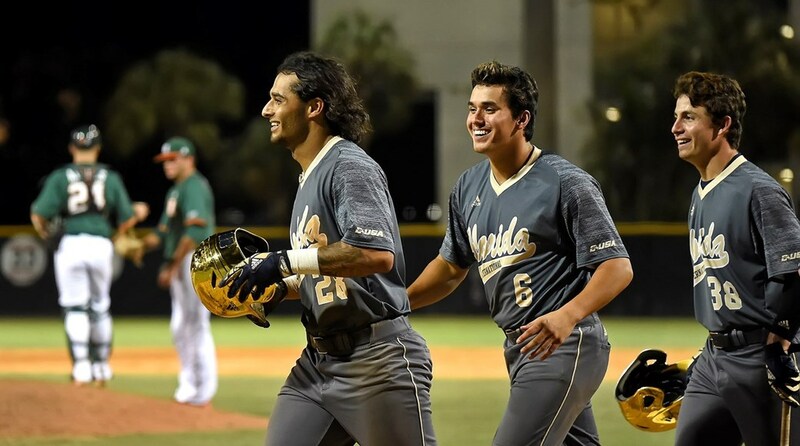 Coral Gables, FL – The FIU Panthers overpowered the Miami Hurricanes Wednesday night, going yard thrice in the 14-6 victory at Mark Light Field for the season series sweep. Chandler Raiden (0-1, 4.80 ERA) started for FIU as UM sent out Chris McMahon (1-0 3.00 ERA). McMahon made his third straight midweek start after being sidelined for over two months, undergoing knee surgery back in January. Unlike the first meeting, where three runs were scored after the first two sets, we were initially treated to a pitcher’s duel. The pitching staff of both teams handcuffed the opposing offenses, sprinkling three hits through four innings combined. Even so, during the first half of the game, both teams had their chances to score. The Panthers almost clawed their first run in the opening frame, after Logan Allen laid down a bunt with Derek Cartaya on first. Michael Amditis botched the throw to second, tossing it over Willy Escala’s head and out towards center. Michael Burns tried to pick up the errant throw but bobbled the ball as Cartaya rounded third, racing towards home. Burns launched it back towards the plate, ultimately gunning down the runner. There were two errors in the crazy play but no runs. In the home half of the inning, Escala made it to first due to Austin Shenton’s high throw to Allen from third. Escala avoided the tag as the first baseman leaped up to make the catch. Romy Gonzalez followed up with a double, moving the runner to third with 2 outs. The momentum ran out of steam with Danny Reyes grounding out to end the inning. Escala reaches by ducking a tag and then moves to third on a Romy Gonzalez double! Miami almost scored again in the second after Amditis slammed the ball deep to center, only to be caught by Juan Teixeira at the wall. At the top of the third, a wild pitch with two runners in scoring position ended favorably for McMahon. The ball bounced right back from the screen and into Amditis’ glove, salvaging the score. FIU started reaching into its bullpen early with Will Saxton taking over in the third, continuing the effort of containing the Hurricanes. He was replaced by Gio Soto the following inning. Soto ran into some trouble after issuing walks to both Gonzalez and Burns. Gabe Rivera went up to the plate, hitting a soft grounder that moved up the runners with two outs, ending Soto’s outing. With Miami threatening, Jose Machado took over, retiring Amditis with a pop fly to left. After four innings of relative calm, everything changed in the fifth. The Panthers broke through with an RBI single from Allen, scoring Teixeira from second. After Allen’s stolen base, FIU tacked on two more runs thanks to an RBI double from Shenton, complemented by an RBI triple from Eddie Silva. Down 3-0, Miami’s troubles were just beginning. After Isaac Quinones struck out with Zamora on third to end their half of the fifth, the blue and gold exploded for six more in the sixth. Pinch-hitter Christian Khawam laced a two-run double to put FIU in a commanding 5-0 lead. Hungry for more, Silva took McMahon deep to center with a three-run dinger to cap off the inning. The Panthers now led by nine. Despite the score, the Canes fought back with a bases-clearing double from Amditis down the leftfield line injecting some much-needed energy back into the ballclub. Both teams proceeded to bring out the big guns, with four more shots over the walls. Adan Fernandez homered at the top of the seventh to push the lead 10-3. Miami responded with back to back home runs from Gonzalez and Reyes to halve the deficit. The Panthers fired back with a three-run ding dong from Javier Valdes in the eighth making it 14-5, effectively putting it out of reach. With the victory, FIU improves to 19-21 while Miami falls to 17-23. For the second straight year, FIU wins the season series. Canes will now hit the road to face FSU this weekend while FIU hosts Marshall. Your @FIUBaseball DEFEATS UM 14-6 in their crosstown series! There was a grand total of five home runs, two from Miami and three from FIU. UM is now 60-19 all-time against FIU at Mark Might Field. Miami leads the all-time series 93-29. FIU ended the game scoring 14 runs on 16 hits and committing one error. UM finished with 6 runs, 7 hits and 3 errors. Eddie Silva had a terrific night, going 2-for-5 with 4 RBIs, including a home run and a triple. Javier Valdes also had a great game, going 2-for-4 with 3 RBIs and a HR. Romy Gonzalez was the lone bright spot for Miami, going 4-for-4 with three doubles and a home run, collecting two RBIs along the way. Chris McMahon lasted 5 1/3, giving up five runs on seven hits and fanning four. A combined 12 pitchers were used in tonight’s game, seven by FIU and five from UM.